Got a surprise at work yesterday. There was a name the guy (and girl) competition at work and my suggestion won! The guy and girl are puppets who are burned on a bonfire. 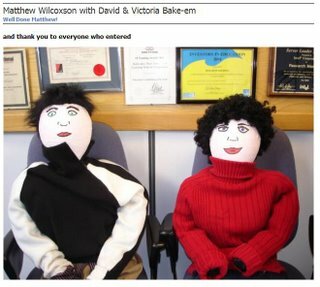 Yep that’s the names “David and Victoria Bake-em”! Good news for Victoria: As the flames lept at David and Victoria’s feet the heat rose and the branch they hung off caught fire. David decided then and there to save Victoria, he heroically dived off the branch into the heart of the fire immediatly roasting to a crisp. But this brave act caused the branch to topple of the fire and throw Vicotria clear of the fire.